You can’t beat a day packed with great preach­ing, every game you love, and a vol­ley­ball tour­na­ment all in one place. 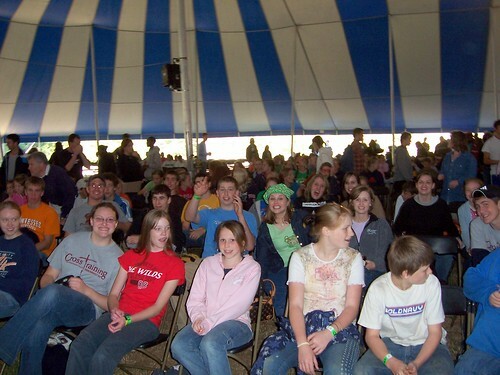 Farm Fest 2006 was awe­some! We headed out of Oak Ridge late after­noon Fri­day and hit I-40 through the moun­tains of TN and NC. Gor­geous drive, but thats another point alto­gether. We arrived at Cal­vary Bap­tist Church in Simp­sonville, SC and got our beds ready for the night. But, it wasn’t time for bed, yet. Knock­out, Uno, Dutch Blitz, Soc­cer, Vol­ley­ball, and Foot­ball fol­lowed with a few breaks for a snack in between. We had a great night together and hit the hay (get it?? its farm fest… AHAHAH) for the night. After an early break­fast, we descended upon the Farm. Our group of thirty com­peted in vol­ley­ball in which we won a few matches. We did the plat­form thingy…and broke a record, con­grats guys. Every­body bounced around from car­ni­val game to gazee­ball to the arm wrestling plat­form where someone…who could it be … whooped all the girls. The preach­ing was pow­er­ful. Mark Kit­trell really con­nected with 3 power packed mes­sages. His last mes­sage on being ready for God to come was espe­cially mov­ing. Don’t for­get the things you heard! And wasn’t it cool to hear all “our” songs sung for spe­cial music. God gave us a great day together and we had a blast. This entry was posted on Wednesday, October 18th, 2006 at 3:12 pm. It is filed under Event Wrapups, Photos and tagged with event, farmfest. You can follow any responses to this entry through the RSS 2.0 feed.